· Silicone rubber coated fiberglass tape is used to protect critical hydraulic hoses, lines, wiring and cables from heat, flame, welding splatter, grinding sparks, contamination, ozone, UV and abrasion. · Fabricated from a knitted heavy-duty fiberglass tape plus the added protection of a thick layer of high-temperature silicone rubber. 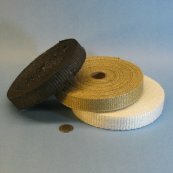 This tape provides thermal and electrical insulation, energy savings and personnel protection. · Very High Temperature Fiberglass Tape products are used to protect a wide range of hoses, lines, tubes, wires and cables from high temperatures and flame. Can be layered to provide additional protection and insulation value. A lower cost alternative to silicone rubber coated fiberglass (firesleeve). Available with a PSA coating. This tape provides thermal and electrical insulation, energy savings and personnel protection. · Knitted Tape is highly conformable and wraps easily and tightly around splices: conforms better than woven tape. · Very High Temperature fiberglass base fabric is impregnated with vermiculite dispersant, resulting in a product with higher continuous temperature capability and added abrasion resistance. Vermiculite coated sleeve can be used for the same applications and plain Fiberglass materials, plus it can also be used to protect copper and aluminum tubing. This tape provides thermal and electrical insulation, energy savings and personnel protection. · available as a slit tape from fabric roll, and as a folded and stitched tape, and a woven tape. This tape provides thermal and electrical insulation, energy savings and personnel protection. · Made from a combination of SiO2 and AL2O3 fibers. Same applications and uses as the Silica tape, but rated to higher continuous exposure. · An excellent replacement for asbestos materials. · Melts above 3000°F / 1648°C. This tape provides thermal and electrical insulation, energy savings and personnel protection. Fiberglass base fabric with aluminum coating reflects over 95% of the radiant heat striking its surface. · Made by slitting roll fabric into tapes. Keeps underlying wires, cables, hoses and pipes cool by reflecting radiant heat. Available with self-adhesive. · Passes easily over bolts on flanges. 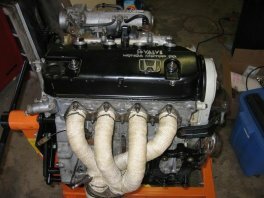 Manifold and header wrapping is widely accepted as standard practice for performance auto and racing applications. There are two reasons for this. First, by adding an insulation layer around the exhaust gas pipig, it keeps the temperature of the gas from dropping, which means the density of the gas is kept lower longer, and lower density means easier flow through the exhaust system. Easier flow means more horse power due to reduced back pressure. Retaining heat in the exhaust flow, resulting in faster exhaust gas flow, also results in higher turbo charger spool speeds, resulting in a gain of horse power. 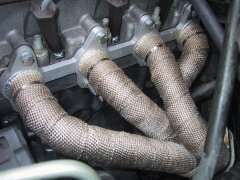 Second, wrapping exhaust system components also reduces the temperature of other under-hood components and systems, reducing both radiated heat and convective heating of electrical components, intake air, fuel and hydraulic hoses. Reducing under-hood temperature also helps reduce hood paint thermal damage. 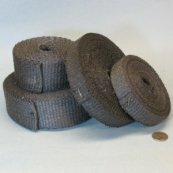 See our complete line of heat reflecting sleeves for protecting wires, cables, hoses and lines.